An excellent budget release of a great kit – although given its complexity, I am not sure that I would to try to build one in a weekend! Eduard's 1/48 scale Fw 190 F-8 "Weekend Edition"
The Focke-Wulf Fw 190 F-8 was one of the most important aircraft in German service in the final year of World War Two. 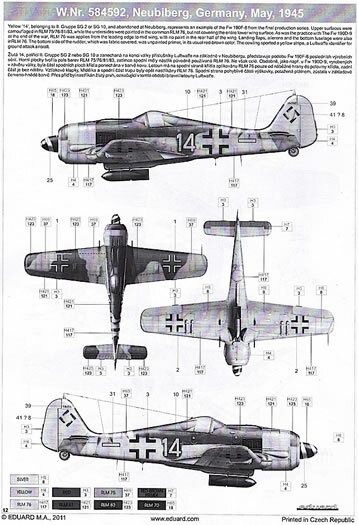 As the main ground attack version of the Focke-Wulf Fw 190 series, the F-8 could deliver a wide range of ordnance while still holding its own as a fighter – a key asset in the context of the Luftwaffe’s shrinking resources. The increasingly chaotic logistic and military situation also ensured that F-8s were finished in a very wide variety of camouflage schemes and unit markings. This feature, together with the Fw 190 F-8’s historical significance and general aesthetic appeal, makes it a superb modeling subject. 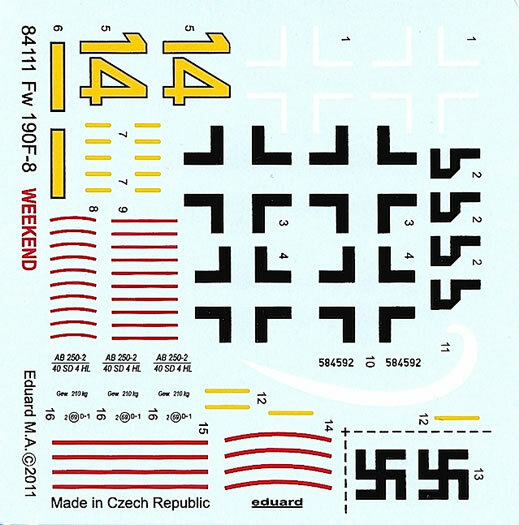 Eduard’s 1/48 scale Fw 190 F-8 kit was first released back in 2008, and reviewed by Brett here. 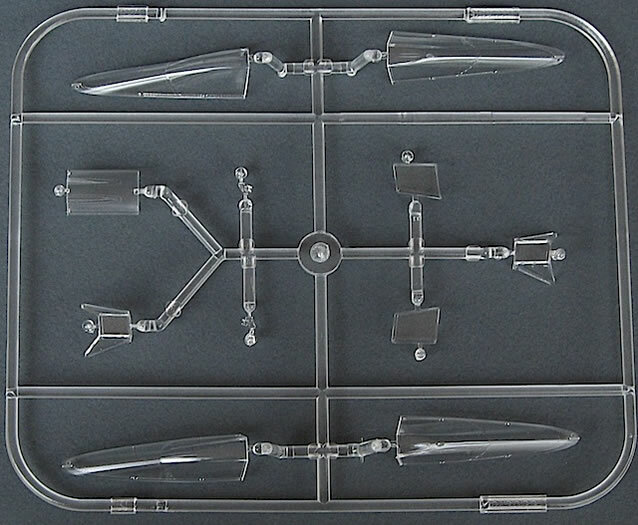 This latest version of the kit follows Eduard’s usual Weekend Edition practice, containing all of the plastic parts, but none of the photo-etch, canopy masks or multiple decal options of the standard release. The trade-off for the loss of these items is a significantly reduced price – approximately half that of the original kit. 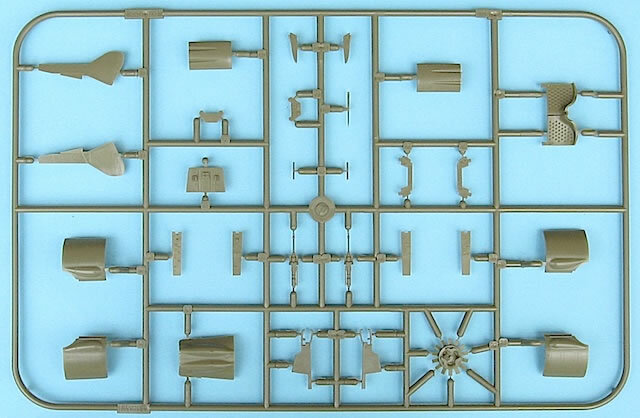 And you still get a lot of plastic for your money – eight tightly packed sprues, some of which are common to all of Eduard’s radial-engined Fw 190 kits, and some of which are unique to the F-8. 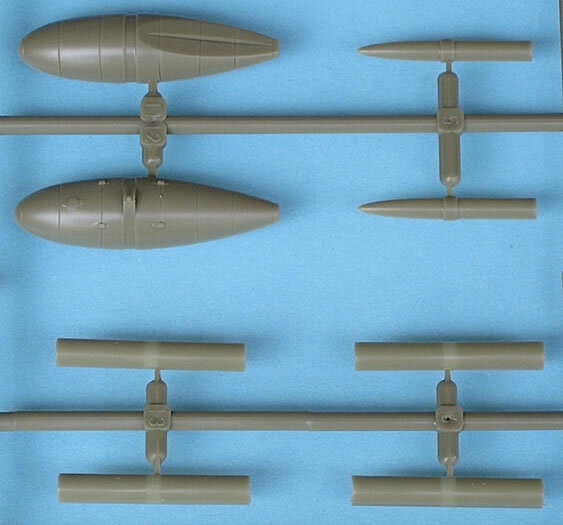 The latter includes an extremely well stocked weapons sprue, which will allow modelers to fit out their kit with just about any possible combination of ordnance that was carried by the F-8. 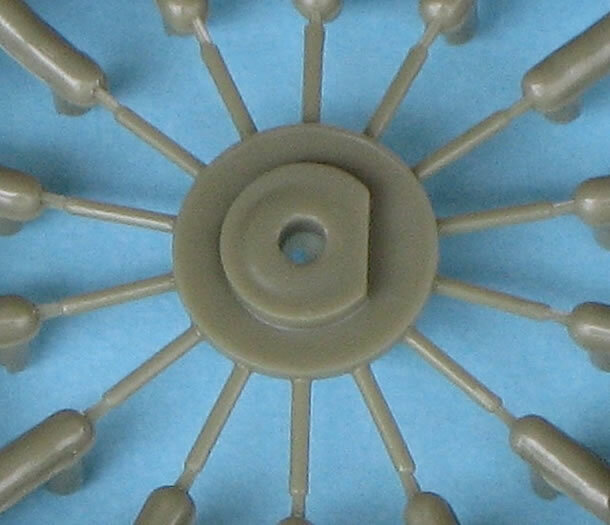 The quality of the plastic is very high. Details are finely engraved or, where appropriate, raised. 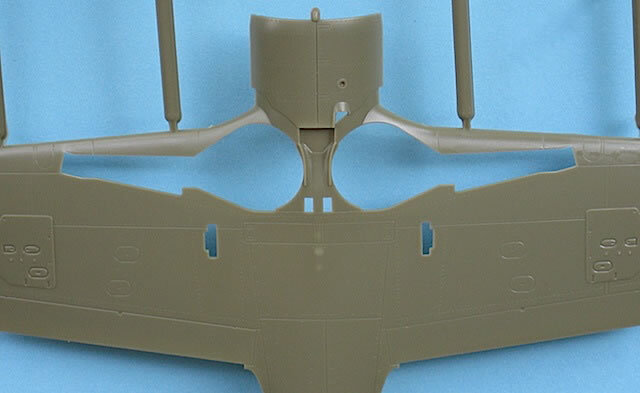 There is no flash on the larger parts, and only a little on some of the smaller parts on the common Fw 190 sprues, which would only take a moment to clean up. Parts detail, including in the cockpit, is sufficiently good that with careful painting, the absence of photo etch should not be a problem. The only items missing from the cockpit that I would regard as essential are seat harnesses, which are cheap and easy to source. 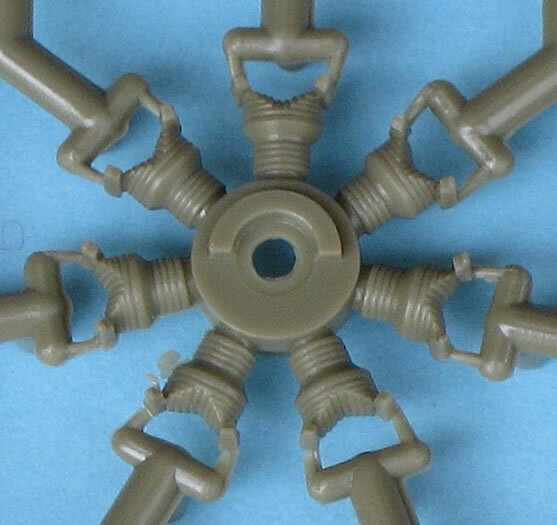 I did notice a larger than usual amount of what seems to be mould release agent on many of the parts, so I would recommend giving all of the sprues a thorough scrubbing in warm soapy water before beginning construction. As standard for Weekend Edition releases, the 12-page A4 instruction leaflet is printed in black and white only. The instructions are clearly set out and appear to be comprehensive. In the nearly six years since the series was launched, Eduard’s Fw 190 A and F kits have developed a reputation for delivering accurate, good-looking models that can be somewhat tricky to build. From what I have read on Hyperscale and elsewhere, most difficulties can be avoided by frequent test fitting and not rushing construction; I would also do some research on how other modelers had tackled their builds. In this context, the F-8 kit being reviewed here is anything but a ‘weekend’ build, because attempting to finish a kit as complex and tightly engineered as this one in just two days would be tempting fate, to say the least! 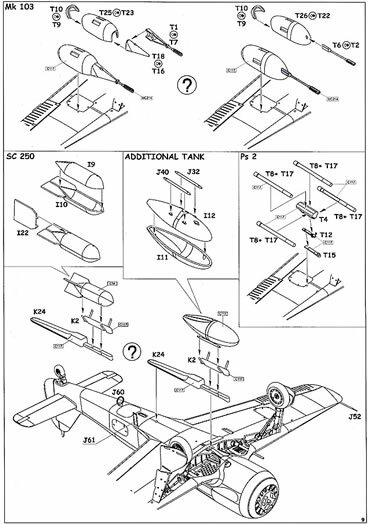 See Brett’s original review of the Fw 190 A-8 kit from 2006 for some tips from Eduard on how not to go wrong with your Fw 190 kit. 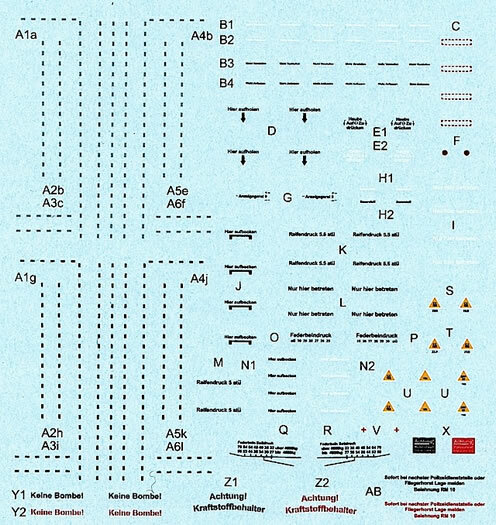 The single decal option provided is for a colourful and well-documented machine, “Yellow 14”/W.Nr.584592, which probably belonged to either SG 2 or SG 10 and which was either surrendered or abandoned at Neubiberg, Germany in May 1945. 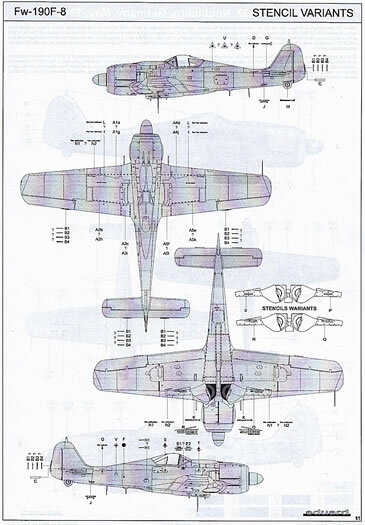 A comparison between black and white photographs of “Yellow 14” on a scrap heap at Neubiberg in late 1945, and Eduard’s painting and marking guide suggests that the latter is a very reasonable interpretation of the aircraft’s camouflage scheme. “Yellow 14” is a popular Fw 190 F-8 with modelers, with Ian Robertson having built a gorgeous example here on Hyperscale from the 1/32 Hasegawa kit. The kit decals look very good on the sheet, with the printing significantly crisper than other examples of Eduard’s in-house decals that I have seen. A full set of stencils is also provided. 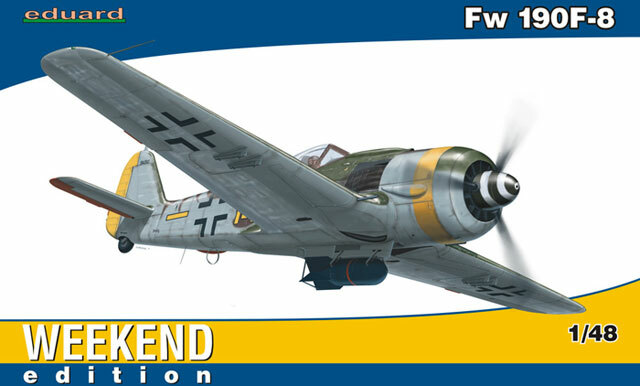 This is another great Weekend Edition release from Eduard, aimed at modelers who want a budget priced, state-of-the-art 1/48 scale Fw 190 F-8. Even without the photo etch and other extras of the standard edition, this kit is highly detailed and will not be a pushover to build. 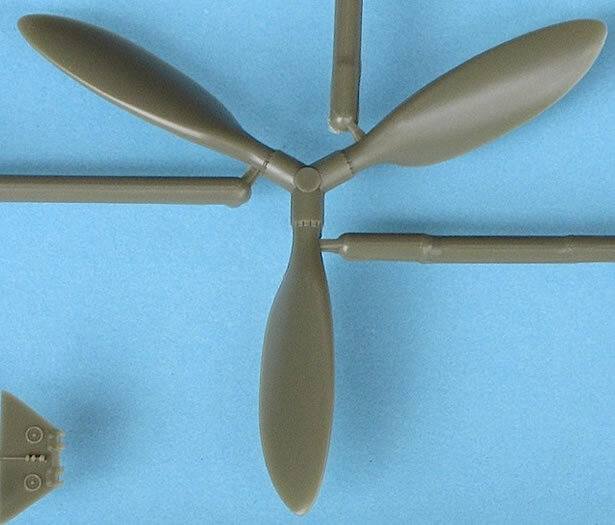 However, modelers who take their time will be rewarded with an excellent model of this important late war German aircraft. Highly recommended.